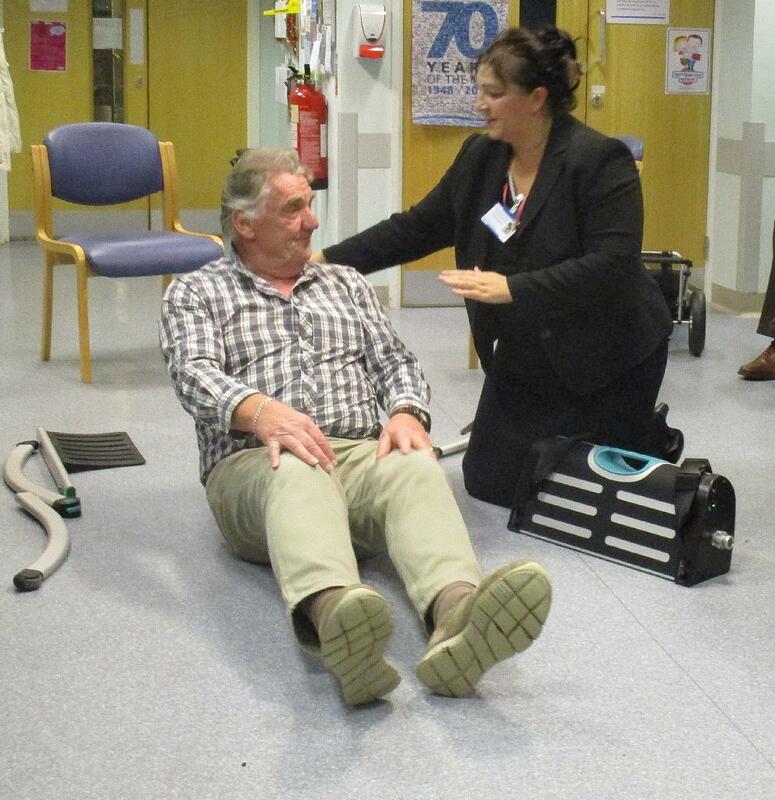 TWO members volunteered to become “casualties” when an East Sussex Healthcare NHS Trust staff member demonstrated a lifting device to the League. Even without the help of committee member Audrey Kerr and vice-president Peter Mitchell-Davis, Susannah Marsden was “pushing an open door.” The League's pre-Christmas committee meeting was so impressed by the £3,000 Raizer device that it immediately offered to buy one for Bexhill Hospital. The decision was part of a total £30,868 package of spending in support of local patients agreed at the meeting. The devices will help staff lift patients safely after a fall. The Trust is seeking the support of the relevant leagues of friends in the hope of installing four Raizers in each of the Conquest Hospital at Hastings and the Eastbourne District General Hospital plus one each in Rye and Bexhill. The battery-powered device comes with its own carry-bag and transporting trolley. It can accommodate patients of up to 24 stones in weight and can perform up to 100 average-weight lifts on each battery charge. 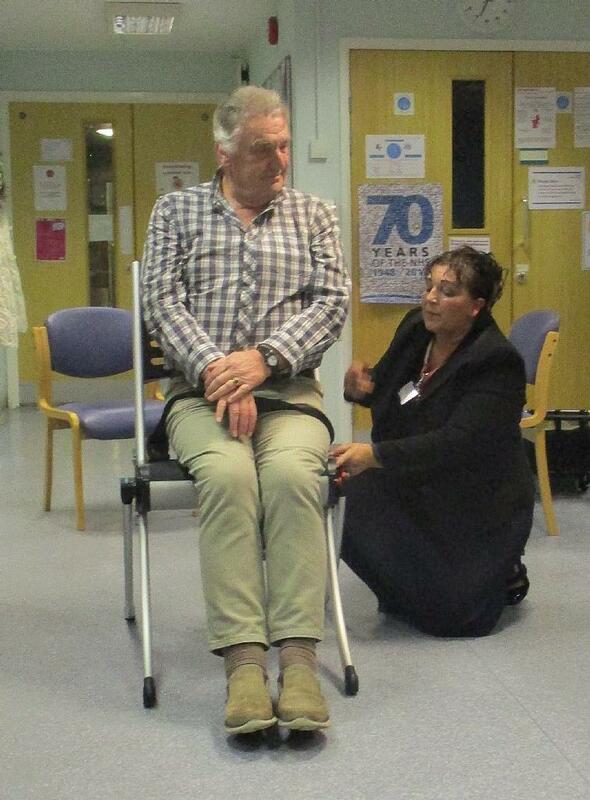 With Peter and Audrey in turn laying on the floor of Bexhill Health Centre's hall, Susannah slipped the Raizer's supporting members under their backs, inserted the device's four legs, strapped the “casualties” securely in place and pressed a button. In moments, the “casualties” were gently raised to either a sitting or a semi-standing position. The committee also agreed to purchase a £6,405 portable bladder scanner for the Bexhill Frailty Practitioner Service. The device can be brought to a patient with mobility problems for assessment rather than the patient having to attend hospital. The meeting approved a £8,463.94 request for the Trust to complete the refurbishment of the garden surrounding Bexhill Hospital's Irvine Unit. The project will complete paving and other measures and provide a gazebo and furniture to the roundel at the front of the unit for the enjoyment of patients. It is hoped to name this project in memory of our former Chairman Cllr Stuart Earl, possibly with the provision of a plaque on the gazebo. Sadly, Cllr Earl died in October. The meeting voted to pay a £2,700 half-share with the course providers to train two Bexhill Diabetic Eye Screening Programme staff to University Diploma in Optical Coherence Tomography standard. The move will free consultants' time and speed the treatment of patients. Twelve years ago the league funded the purchase of bedside televisions for all 48 beds in the Irvine Unit plus the provision of large-screen tvs for the central atrium and foyer. The scheme was aimed at providing viewing free of charge to patients with the facility for staff to screen a daily update giving such patient information as the day's menu. Sadly, tv unreliability and lack of an effective maintenance contract has always been a problem. Now with the help of hospital Facilities Manager Ann Loyd and her deputy, Mark Oak, a suitable new contractor has been located in Eastbourne. League Treasurer Chris Ashford is negotiating a new contract which will include the provision of 48 new bedside televisions, replacement of the aerial, re-installation of the system which will facilitate daily updates and include a yearly maintenance agreement. The meeting voted £12,000 and gave the treasurer authority to conclude a deal. Following long-held tradition, league members will be touring the Irvine Unit on Christmas morning, distributing useful hospital-stay gifts to all patients in a gesture costing £300.